Gordonias are the lesser known cousins of camellias. They are rarely grown in home landscapes, but have a number of outstanding ornamental qualities that make them worthy of consideration. 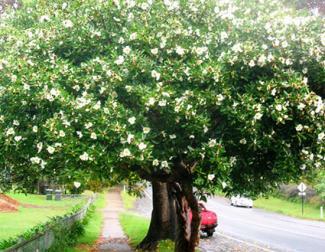 There are dozens of Gordonia species, most of which are native to Asia, but few of which have been cultivated by gardeners. Neither are prone to pests or disease, but both have fairly specific growing requirements that must be met. They are not known for being tough and adaptable plants, so much as unique specimens that are very rewarding to have in the landscape if they can be grown successfully. 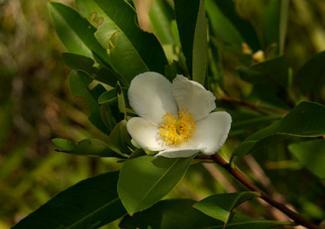 Known botanically as Gordonia axillaris, this is a large evergreen shrub that bears a strong resemblance to some of the white-flowered varieties of camellia. Like many camellias, the blossoms, which are typically three to four inches in diameter, appear in fall. The blossoming period continues through the winter in frost-free climates, a rarity among flowering shrubs. It's important to note that these are not very cold-hardy shrubs. Cultivation is restricted to areas where winter temperatures do not drop below 10 degrees. The name fried egg plant comes from the appearance of the flowers. They have a large cluster of bright yellow stamens in the center resembling a yolk. Unlike camellias, the flowers do not turn brown while still on the plant; they fall to the ground with their color intact, making a beautiful carpet around the plants. Plant fried egg plants in sun or partial shade in rich organic soil. They prefer somewhat acidic soil conditions and require regular irrigation. Fried egg plant grows slowly to about 15 feet tall and wide with a trim and tidy appearance. The foliage is lance to oval-shaped and glossy, making an attractive backdrop when it is not in flower. They are great hedge plants, but are an even better specimen among low-growing perennials that share their growing requirements. The lower branches can be trimmed off to train them as a small tree. 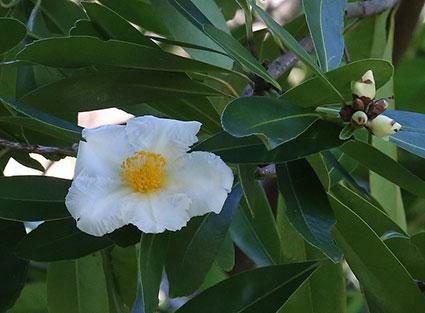 Gordonia lasianthus, commonly called loblolly bay, has a similar overall appearance to the fried egg plant, except it grows as an evergreen tree and its flowers are a bit smaller. It starts flowering in early summer and often continues until August. Growing slowly to 50 feet or more, loblolly bay has a pronounced upright growth habit, it's canopy rarely spreading more than 10 feet wide. Loblolly bay is a bit more cold hardy than fried egg plant, but it is more exacting in its cultural requirements. It is native to the southeastern United States where it grows in wet places as an understory tree under large hardwoods, like maple and tupelo. 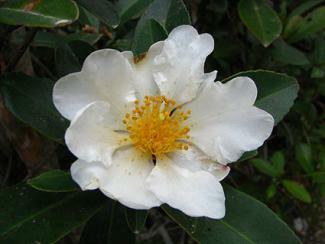 Like camellias, it requires acidic soil conditions and the richest possible soils. Though it grows in boggy places in its native terrain, it seems to require a combination of good drainage and constant irrigation to thrive under cultivation. It is definitely not a tree for hot, dry places. The foliage is exquisite, with a deep lustrous green on the top side of the narrow 6-inch leaves and a matte gray on the bottom, which is visible whenever there is a breeze. The foliage remains through the winter but becomes tinged with bronze and magenta tones in cold weather. Because of its shade tolerance and extremely upright growth habit, loblolly bay is a good candidate for tight places between buildings or against the northside of a multi-story home. It's also useful as a tall hedge on large properties with a mature tree canopy. There has been a limited amount of breeding work carried out with loblolly bay. A cultivar known simply as 'Variegata' has white streaks on the leaves and is even more beautiful than the species, though it is rarely seen in nurseries. 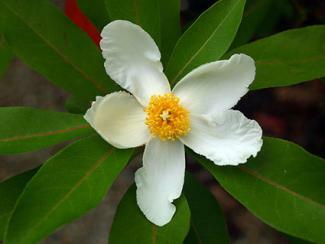 There is also a hybrid between loblolly bay and a related plant called Franklinia. It goes by the name Gordlinia and is more cold hardy and less finicky to grow than loblolly bay. With the exception of gardeners in the deep south who are planting loblolly bay in its native habitat, Gordonias are largely plants for dedicated horticulturalists. They grow slowly, but are long-lived and jaw-droppingly beautiful, offering ample rewards for the effort involved in cultivating them.